Chances are, when most people think of spring in Atlanta, they think of the purple haze of Redbud trees, the white fluttering of Dogwoods and the wall-to-wall rainbow of Azaleas. 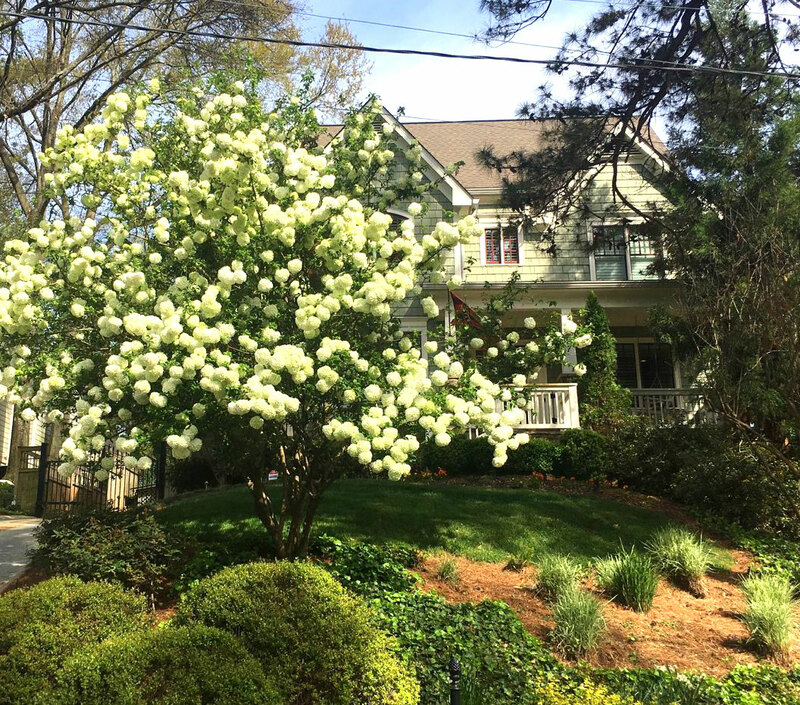 It’s a beautiful city in all seasons and spring may be the jewel in Atlanta’s horticultural crown. There are a lot of less-considered plants for color and interest that can be incorporated into a yard or garden, some more unusual choices that might get a lingering gaze from passers-by or even the squeal of car brakes driving past a front yard. Take, for example, Snowball Viburnum. Would this beauty not stop just about anyone in their tracks? Ok, she’s a big girl – 12’ to even 20’ – but she can be pruned immediately after flowering to control size if you must. Better yet, prune this statuesque stunner into a small tree! The flowers start out a lovely chartreuse green and grow larger and larger until they are a perfectly-white froth of bubbles. And the color usually lasts a month. What they lack in fragrance they more than make up for by providing beautiful blooms for cut arrangements inside. Pick a sunny spot for the most flowers. While she quietly exits the show in May, you’ll certainly remember this life-of-the-party for a long time to come! We’d be glad to help find some room for one in your garden! Contemporary Gardens is dusting the pollen off of their old look and rolling out a spring makeover. “It was time for us to take our new logo and expand it to all collateral, trucks and yard signs,’” said owner David Pyron. If you are one of our landscape maintenance clients, you’ll definitely notice our bright new trucks. Contemporary Gardens teamed up with MOCK, the agency, to create a look and feel that is stopping traffic. “A fleet of vehicles is an excellent opportunity to help build a brand. 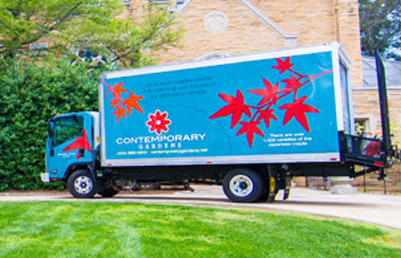 Each truck is a rolling billboard for Contemporary Gardens. We designed the trucks to be visually eye-catching while demonstrating their landscaping expertise through interesting facts about specific plant and flower species,” said Donald Mock, owner of Mock, the agency. Contemporary Gardens understands how important it is to look professional while their team is working in your yard. Each truck highlights a different southern flower and all sorts of fun facts that are sure to delight even the most disgruntled Atlanta driver. Be on the lookout for our dazzling trucks and more exciting makeovers that are on the way! Over 16 years ago a Japanese Maple tree was planted as a living memorial to Alec Martin on the grounds of E. Rivers Elementary. At the time, Martin’s grandmother was an active volunteer with the PTA and wanted to plant a special memorial to her grandson who had passed away. 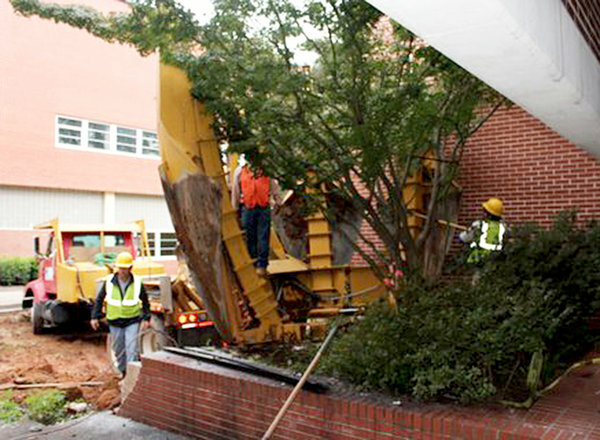 When E. Rivers Elementary went under major demolition last fall, the tree was slated to be destroyed. That’s when E. Rivers parents, Stephanie (PTA co-President) and David Pyron stepped in. “It was important for us to save this tree, not only for its beauty, but for the sentimental meaning the tree brings to the Martin family, E. Rivers Elementary and the community,” said David Pyron. David’s company, Contemporary Gardens, volunteered sizable equipment and time to safely remove the tree and have it replanted in a temporary home across the street. When the campus finishes its construction, David’s team will bring the tree back home. “Community service is an important part of our guiding principles at Contemporary Gardens. We are proud of the fact that we help the neighbors and the community in which we work,” said Pyron. E. Rivers Elementary is located at 8 Peachtree Battle Avenue, NW, Atlanta.